1 Have you ever ridden the bumper cars at the amusement park? You drive around on a slippery floor in a car with a huge rubber bumper around it. You move forward and backward, bumping into anyone in your way. The earth's crust is a lot like those bumper cars. 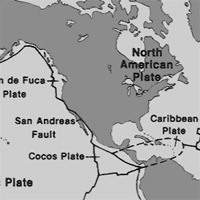 2 The earth's crust is made up of several large plates and some smaller ones. They all float along on the asthenosphere. This is a layer of partly molten rock. It lies under the upper mantle. As these plates move, they bump into one another. Sometimes they move away from each other. The places where they meet are called plate boundaries. 3 There are several types of plate boundaries. Most are found on the ocean floor. The first type is a divergent boundary. This is where two plates move away from each other. A mid-ocean ridge is an example of this type of boundary.